I know what you’re thinking. What is this dummy trying to accomplish here? Of course, I know about stop signs. 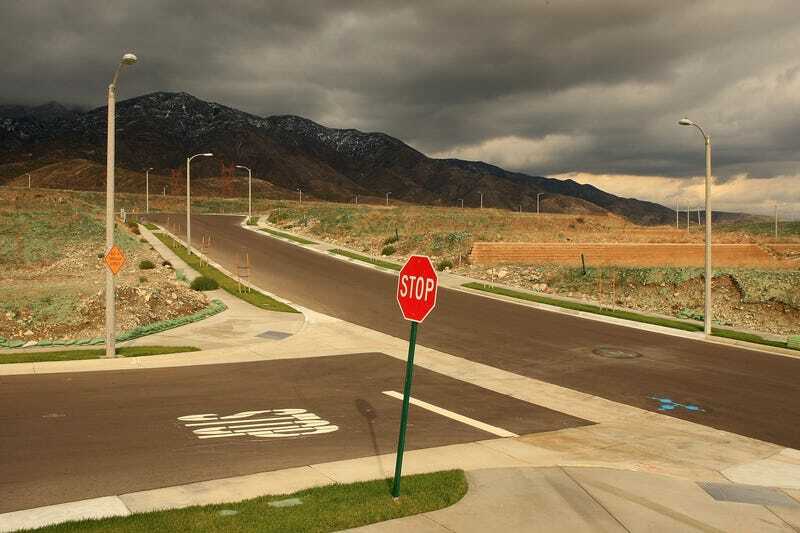 But maybe—maybe!—you didn’t know this: stop signs weren’t always red. We’ve talked about other red things before, and there’s a reason we ended up with red octagons telling you to STOP. I swear it’s interesting. Here’s why stop signs are red. In the early 20th century, driving was a discombobulating mess. Streetcars shared the road with horses, cars, people. A form of traffic control was needed. William Phelps Eno. Photo: Wikipedia. One solution was offered by William Phelps Eno, a wealthy New England native, who conceived the stop sign in a 1900 article for Rider and Driver magazine titled “Reforming Our Street Traffic Urgently Needed.” According to the New York Times, Eno—whose name lives on in the form of the transit-oriented group Eno Center for Transportation—suggested placing stop signs at intersections. But his advice wasn’t heeded until the following decade. The first stop sign was erected in Detroit, and though some accounts pin the historical moment to 1915, a story from the Detroit Free Press says it went up a year prior, at the corner of Cass and Clifford avenues. At the time, not everyone in town liked the idea. Detroit’s first stop sign is oftentimes described as a 2' by 2' white square with black lettering. Unfortunately, I couldn’t track down an image of it, but the photo here was taken in 1915 at the corner of Woodward and Jefferson. At the very least, it offers a glimpse of the first stop signs that were initially rolled out. Toward the left of the image, you’ll see the letters STOP situated above a crow’s nest-style traffic stand. It’s a far cry from the ubiquitous red octagons of today. Round: warnings at railroad crossings. The following year, the inaugural National Conference on Street and Highway Safety was held. A lengthy report with a litany of recommendations followed, including a sub-section on sign colors. As far as I can tell, the 1924 report marks the earliest date when red is recommended as an appropriate choice for STOP. But early on, most stop signs were yellow. In the 1930s, a committee of traffic engineers formed the Joint Committee on Uniform Traffic Control Devices, with the intent of producing a standard manual for street designs that could be replicated everywhere. By 1935, the group produced the first Manual on Uniform Traffic Control Devices, a bluebook of sorts that has been updated and remains relevant to the present day. The inaugural edition called for regulatory signs to be black on white rectangles, except for stop signs, which would be shaped like octagons with black lettering on a yellow background, or yellow lettering on black. Archive.org, the wonderful Internet repository for just about anything, has excerpts from the 1935 edition. Yellow seems like it’d achieve the same effect of catching someone’s attention. But the intention all along—as it was recommended by 1924 National Conference on Street and Highway Safety—was to eventually go red. The problem? “The standard design, therefore, has hitherto called for a yellow background with black letters, though various arrangements of a contrasting horizontal panel have also been used in an effort to improve legibility, especially in connection with reflectorization,” the document reads. But a West Coast state known for playing a significant role in how vehicles are regulated today had a solution, the manual says. California, having solved the problem of durability by resort to porcelain enamel, has used red for many years. The recent achievement of dependable red finishes available in competitive materials, has made the red sign practical, and the Joint Committee has recognized an apparent trend of opinion among highway departments by accepting the red sign as the sole standard, eliminating the yellow sign and its variants with contrasting panels. There’s probably a simple answer to this. Red stands out, right? Red won’t blend into the foreground. My eye doctor once told me I have a red-green deficiency (maybe that’s still true? ), but I’ve never had a problem properly deciphering a stop sign. And I mean, look at that shot up top—a lovely, sweeping image. The red cuts through clearly. You could see that coming a mile away. There might be more to it, though. The folks at BrainStuff dove into the issue a couple years ago, producing a cheerily informative stop sign clip, if you’re among the TL;DR crowd who hates what’s happening in this post. In particular, the clip highlights a 2011 study from Psychological Science that involved male rhesus macaques—a species of monkeys living in Puerto Rico—and how they responded to certain apple slices. Two human experimenters, one male and one female, entered the monkeys’ colony and found isolated males to test. Both people knelt down, placed a Styrofoam tray in front of them, drew an apple slice from their backpacks, held the slice at chest level for the monkey to see, then placed the apple on the trays. Both stood up simultaneously and took two steps back. It’s just one study, but who knows? Maybe we’re predisposed to respond fearfully of red. Or, maybe, after a half-century of responding to red stop signs, red traffic lights, and the blinking red lights of cop cruisers, it’s just too damn hard to ignore the color when we drive. Haven't You Ever Wondered Endlessly About Super Basic Stuff?